This is not something I’m proud of, believe me. I don’t want to win a contest of emotions over fictional characters. But seriously, I let out a half scream queen, half child-with-a-broken-toy or limb noise, then threw balled-up socks (I was doing laundry at the time) at the wall and ran into the bedroom crying. But no. With the visual help of David Benioff and D. B. Weiss, George R. R. Martin stabbed a pregnant woman in the stomach, slit the throat of a mother and son who have already been through too much, and shot her son’s wolf full of crossbow bolts in front of Arya Stark, who was sitting outside the gates anticipating her first happy moment since long before her father’s death. To add insult to injury, the guy behind it all (a nearly sadistic equal to Martin himself) was played by David Bradley, better known as Filch in the Harry Potter movies. Remember the face Filch made when his cat died? Yeah. Me too. I just made it. I don’t feel much of a need to explain exactly what happened, because if you’re reading this, you’re supposed to already know. All I’ll say is that this all supposedly happened because Robb Stark broke his daughter-marrying promise to Lord Walder Frey, but really it’s because Game of Thrones was intentionally made to disprove the theory that unhappy endings don’t get viewers. That Disney movies and rom-coms are not reality. That life is not all tea parties with unicorns that poop gold and bacon. Martin once reportedly admitted in a panel that Catelyn Stark (one of the deceased, and arguably the strongest female character next to the Khaleesi) and her daughter, Sansa, are his least favorite characters. Then he admitted that it was so “difficult” for him to brutally kill Catelyn and Robb Stark that he wrote the Red Wedding chapter last. Michelle Fairley (Lady Stark) and Richard Madden (Robb) have both commented on the twist. It just really broke my heart. Arya being so close to getting to me. That really cut me up even more. With every episode Robb’s been further and further from the people he loves. For Arya to be so close to getting to me, I think that’s what really hurt because that’s what we all wanted — to get the family back together — even if it was only one of us coming back. And that’s what made me really emotional. There’s a moment in the scene where we look at each other. It’s Robb Stark essentially saying goodbye to his mother and giving up. Rather than it being something really bad, it’s a moment of tragedy and utter relief, actually. These characters have fought and fought and fought and it’s finally over. And I think me and Michelle felt a lot of that, and a lot of the crew, actually. And here’s Arya Stark/Maisie Williams’ humorous Britney Spears-esque reaction. “My mother and brother are dead. Like OMG dead.” ……..Stay tuned for Justin Bieber’s……. 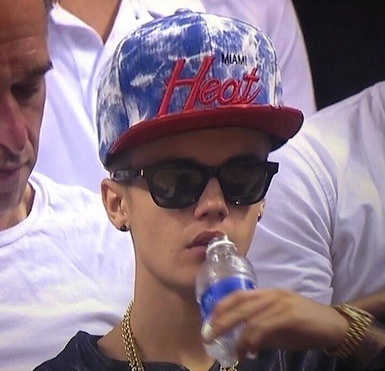 Below is a photo from Danielle Fishel’s Twitter with a caption about JB needing to take his giant stupid hat off and show some respect for Miami Heat fans of equal height. And dead Starks. 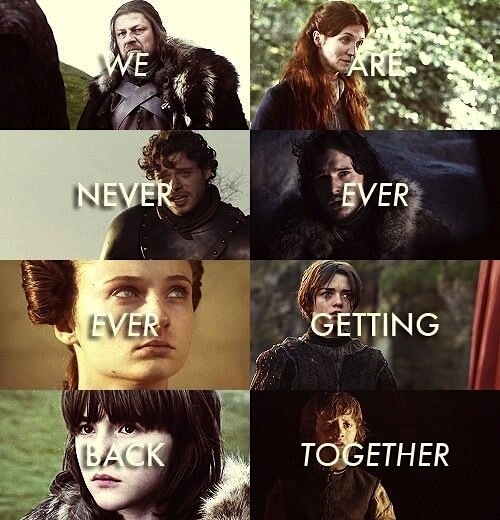 Speaking of Twitter, there’s an entire account dedicated to Red Wedding sadness.